The unprecedented success of high yield, financially viable horticultural produce has hit the headlines in recent times. No, it's not the shamrock, even with St Patrick's Day barely less than a fortnight away. This other plant has been so successfully grown here, indoors and outdoors, and is so widely used there may well be plans afoot to replace the shamrock as the national symbol of Ireland. Some of the people of Ireland get so carried away with the excitement of St Patrick's Day what the parades, the drinking, the trad, the razzmatazz and the Irish dancing, they have taken to wearing huge clumps of shamrock clover as a way of proclaiming their Irishness. Some day soon a hungry heifer will end up eating one of these people by accident. The new symbol, though, is used all year long and grown all year long. The imposter plant isn't even native. The pretender is an import, unlike the shamrock which has been here for at least 1,587 years. Scholarly as ever, I get this figure by going back to the year of St Patrick's death in 432AD. The usurper has made a far bigger impact in the space of 50 years. The foreign plant is a widely recognised symbol and can be seen on the backs or fronts of polo shirts all over the world. There are marketing advocates who steadfastly maintain the proposed new national symbol of Ireland will be more easily recognised than the "dear little shamrock, the sweet little shamrock", to quote the well-known song. But the rock and roll advocates for change are adamant there are far more songs written about the new motif. The new plant has no great history here. It seems it was introduced in the 1960s. The new national symbol of Éire was grown outdoors to begin with in the far southwest, where the mild weather and warm rain was of great assistance to the small band of growers who grew the introduced species mostly for their own use. It prospered and the hardy band of growers sold off their excess produce. Seeds were harvested. Students and people who found it hard to get out of bed in the morning took to growing the plants in bedsits. Canny businessmen gathered together in groups known as gangs and imported the plant for sale and distribution through a network of agents who sold the crop at house parties and the like in much the same way as Tupperware and, laterally, Ann Summers. 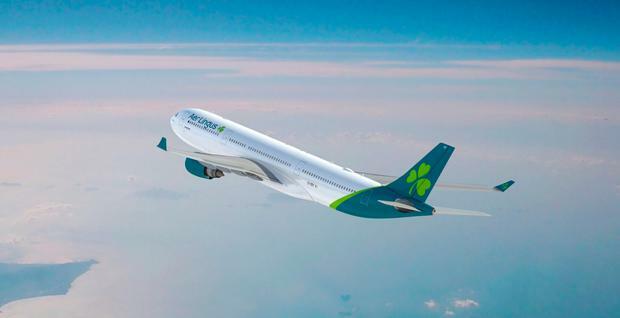 Aer Lingus spent €2m last year on rebranding the airline by means of a stylish, modern new logo. It may have been money down the drain. The usurper could appear on the tails of Aer Lingus planes, or even on the chests and crests of the Irish sporting teams. Maybe, the way things are going, the Taoiseach will present a bowl of the widely available plant to the president of the United States on St Patrick's Day. The evidence of the plant's popularity is there for all to see. Last October, gardaí found €100,000 worth of the plant in two horticultural facilities in west Cork, known in the trade as a grow house. These are usually bungalows where the heat is left on all day like hotels catering for Americans and the proponents of same maintain there is never any shortage of hot water in the hot tank. Last month what gardaí described as a "significant" amount of suspected cannabis plants were destroyed in a fire at a grow house in Bruff, Co Limerick. There was €210,000 worth of plants and seeds found in Dundalk a couple of years ago. Seven years ago, gardaí discovered an estimated €1.6m of cannabis plants in Tramore in Waterford, €1.4m in Swinford in Mayo, €1.2m in Ardee in Louth and €800,000 worth in Newbridge in Kildare. There were big Garda finds in Roscommon and Kilkenny. Longford had several grow houses. There was €360,000 worth of the new shamrock found growing in a house in Abbeylara a few months ago. Last year, €45,000 worth of plants were confiscated from a three-bedroom house in south Longford. Two years ago, €200,000 of potted plants were detected in a house near Carrigallen. The gardaí did their best and had huge successes. Ask your friend the guard what he or she thinks. They will tell you drug use is rampant and out of control. Twelve houses were raided by the gardaí in south Kerry in 2018. The gardaí have done an incredible job but when one grow house closes down, another opens up. I could go on and on. This is just a random trawl through the country. Every town and every village has a drug dealer with a lot more dangerous drugs for sale than cannabis. The horticulturalists have a saleschild in nearly every secondary school in Ireland and several primary schools. There is strong evidence to suggest cannabis use by the young can lead to serious long-term damage. That much is definitely proven. There is so much to be thrashed out from the different ends of the debate, such as proposed legalisation to mandatory sentences. The big question is why are so many people using drugs regularly? There has been no worthwhile national conversation. We wrote here about drug use in the universities and it is an epidemic. Just ask the students. Drugs are everywhere. The scale is unprecedented. The millions made will corrupt or have corrupted Ireland. Yet politicians on all sides are ignoring the problem. Homelessness is linked to drug use. I hope all of our people find a place of their own to call home but the drugs scourge dwarfs all of the problems we face as a nation. Cocaine use is rampant. The taking of cocaine is seen as no more eventful than having a coffee. There are no social boundaries between rich and poor. Drugs are widely available and are cheap. Check your local paper. You will read of heroin use in country places and raids for killer drugs in every county. The regional papers are doing a wonderful job. Gardaí have told me these murderers have groomed kids to sell their drugs. So have addiction counsellors. Dealers use blackmail and threats. Ask your kids. Ask anyone in the know. We need a great debate but there has to be a short-term fix before it is too late. More resources must be given to the gardaí. Existing resources must be refocused. Not one Opposition or Government politician has gone on a crusade. There have been no big marches. No water charges numbers marching on our streets. Why? Is this drug epidemic not serous enough? Is there corruption? And all the while, a generation of lovely young people are being slaughtered before our very eyes. Maybe the use of the cannabis plant as our national emblem is outdated. Is the coca plant not more popular now?